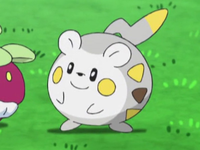 Sophocles's Togedemaru is Sophocles main Pokémon. Its Ability is Lightning Rod which makes it able to absorb electricity with its spikes and then release that electricity in the form of a move. It participated in the second Alola! Surprise! verses Pikachu which was a balloon popping challenge. Its spikes on the back in combination with its Zing Zap move, allowed it to quickly pop all the balloons before Ash and Pikachu could to win the challenge. Zing Zap SM 2 It quickly popped a lot of the balloon in the challenge. Alola to New Adventure!アローラ！はじめての島、はじめてのポケモンたち！！Alola! New Islands, New Pokémon!! The Guardian's Challenge守り神カプ・コケコ登場！挑戦、オレたちのZワザ! !Enter the Guardian Deity Kapu-Kokeko! Let Us Attempt To Master Our Z-Move!! 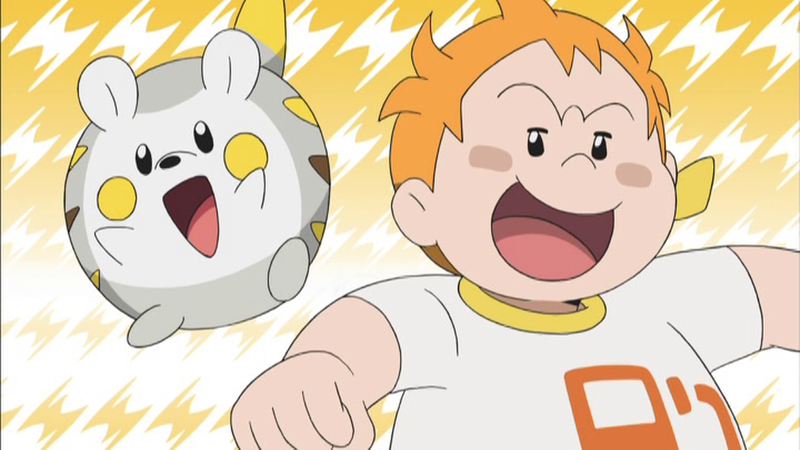 Loading the Dex!よロトしく、ボク、ロトム図鑑ロト！Good Rotomorning, I am the Rotom Zukan! モクロー登場！アローラでポケモンゲットだぜ! !Enter Mokuroh! I Got a Pokémon in Alola!! That's Why Litten is a Scamp!市場の風来坊ニャビー！The Marketplace Wanderer, Nyabby! タマゴ係はだ～れだ？Who's in Charge of the Egg? ぬしポケモンはデカグース！The Totem Pokémon is Dekagoose! 出るかＺワザ！ 大試練への挑戦！！Will the Z-Move Work?! Challenging the Grand Trial!! 課外授業はヒドイデ！？The Extracurricular Lesson is on Hidoide?! Getting to Know You!勇気の結晶、リーリエとロコン！The Fruit of Courage: Lilie and Rokon! Rocking Clawmark Hill!爪あとの丘、イワンコとルガルガン！！Scratchmark Hill, Iwanko and Lugarugan!! アローラ探偵ロトム!消えたクリスタルの謎! !Alola Detective Rotom! The Mystery of the Lost Crystal!! 電撃猛特訓！カプ・コケコとの再戦！！Intense Electric Shock Training! A Rematch with Kapu-Kokeko!! 衝撃！ ダグトリオ解散! ?Here's a Real Shocker! A Dugtrio Split-Up?! アローラ！ はじめての授業参観!!Alola! The First Visitation Day!! クリスタル争奪戦！ロケット団対スカル団!! !The Fight Over the Crystal! The Rocket Gang VS The Skull Gang!!! A Glaring Rivalry!出でよ！紅き眼差しルガルガン! !Come Forth, Lugarugan with the Crimson Look!! 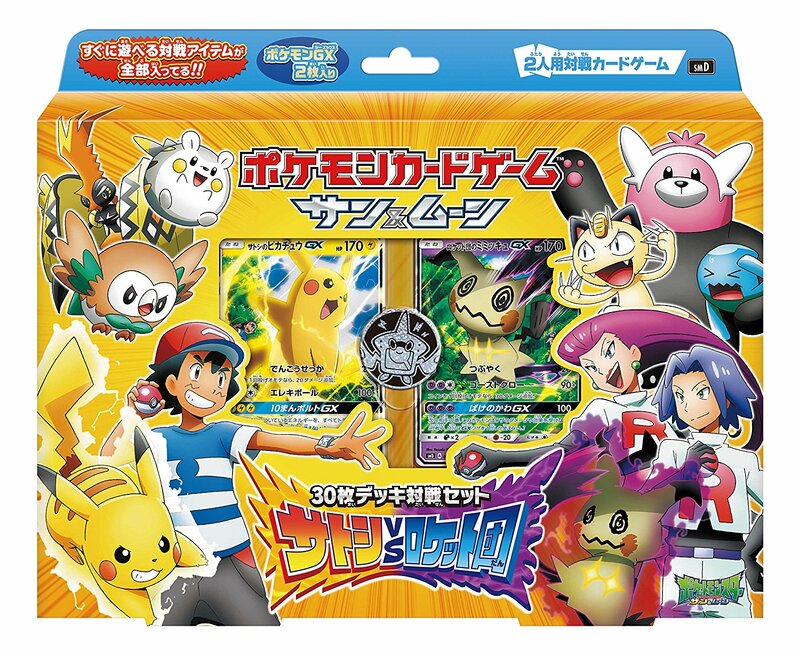 Pulling Out the Pokémon Base Pepper!熱闘ポケベース！ねらえ逆転ホームラン！！The Fierce Pokébase Game! Aim for a Home Run to Turn the Tide!! ネマシュの森であなたも寝ましゅ？Hey Mush, Are You Going to Sleep in the Nemush Forest Too? ライチ登場！泣いて笑って、島クイーン！！Enter Lychee! Cry and Laugh, Island Queen!! お宝発見！ムーランドサーチ！！We Found a Treasure! Mooland Search!! ヨワシ強し、池のぬし！Little Yowashi Isn't Lacking, It's the Lord of the Lake! A Crowning Moment of Truth!炎のバトル！ガラガラあらわる！！A Fire Battle! Garagara Shows Up! !